The Workplace Safety and Insurance Board (WSIB) in Ontario measures Lost-Time Claims per 10,000 Employed Workers over the age of 15. This measure relates to employee health and workforce productivity. WSIB classifies employers according to whether they are Schedule 1 (businesses and industries) or Schedule 2 (eg. provincial government, municipalities, school boards, public library boards, international bridges, railways). In 2016 in Niagara, there were 1523 Allowed Lost Time Claims for people working for Schedule 1 employers, and 332 for people working for Schedule 2 employers. Niagara’s rate of Lost Time Claims per 10,000 Employed Workers in 2016 was 102.3 (higher than the Ontario rate of 98.73), with the majority of these Claims coming from workers in the Services sector. A focus on workplace mental wellness is emerging in Niagara. According to the Mental Health Commission of Canada (MHCC), in any given week, as many as 500,000 Canadians are unable to work due to mental health problems or illnesses. While there is a trend toward high-profile people in Canada speaking out publicly about their own personal mental health struggles, there is stigma associated with mental illness. Stigma is a major barrier preventing employers from promoting mental wellness, and employees from reporting mental health issues to their employers. Paying attention to this is important because there is a strong link between employees’ mental wellness and productivity in the workplace. It is estimated that the total cost of mental health issues in the Canadian workforce is $50 billion per year, including $6.7 million in absenteeism alone. This figure is expected to increase over time. According to national figures provided by the Centre for Addiction and Mental Health (CAMH), we can estimate that approximately 6,200 Niagara residents call in sick to their employer every week due to mental illness. The Mental Health Strategy for Canada, produced by the MHCC, encourages all employers to create and maintain mentally healthy workplaces. The MHCC provides tools, information, and support to ensure that every Canadian can go to work knowing their organization recognizes the importance of psychological health and safety in the workplace. The MHCC cites the Canadian Community Health Survey by Statistics Canada to show that 28.4 per cent of Canadians aged 15 to 75 in 2012 that worked over the past year reported that most days at work are quite a bit stressful or extremely stressful. This is important because work-related stress extracts a huge fiscal and social toll in Canada. Stress associated with the workplace lowers productivity, increases short- and long-term absences and contributes to mental health problems among workers. One focus area for Implementation of the Niagara Mental Health and Addictions Charter is Student and Workplace Mental Wellness. 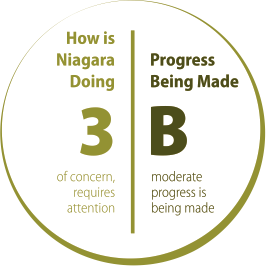 In support of this focus area, in 2016, Niagara Connects worked with the Canadian Mental Health Association Niagara Branch, Niagara Region Public Health and the Greater Niagara Chamber of Commerce to complete preliminary research to describe Psychological Health and Safety in the Workplace in Niagara, as it relates to employee productivity. The National Standard of Canada for Psychological Health and Safety in the Workplace, launched in 2013, is the first of its kind in the world. It is a set of voluntary guidelines, tools and resources intended to guide organizations in promoting mental health and preventing psychological harm at work.